Next time Princess Piggy Poo and I spend time with her doggy friend Edalani, she will be in for a treat. In addition to Edalani and her cat friend Sweet Pea (who has various other names too numerous to remember), there are now two guinea pigs at the residence: Flipper and Rainbow Sherbet. While Princess Piggy Poo hasn’t had the opportunity to meet her new friends, I met them last Friday. They are sisters. One is a lighter brown and the other a bit darker. Seeing those cute cavies made me realize two things about Princess Piggy Poo: 1. She is extremely tame, and 2. She really does live like royalty. When I removed the cardboard where Flipper and Rainbow Sherbet were hiding, they started jumping all through their hutch as if they were on fire. Princess Piggy Poo may hop around a bit when I lift her hiding house, but she knows she’s getting picked up and she’s okay with it. Also, the sister cavies live outside in a wooden hutch while Princess Piggy Poo lives inside with a castle, a bedchamber, central heat and air conditioning. The outside guinea pigs probably get fresh air and sunshine, which Princess Piggy Poo might enjoy if she had the opportunity. The fear of escape or fleas and other critters make me hesitant to let Princess Piggy Poo outside the palace. This entry was posted in Uncategorized and tagged cat, cavies, doggy, friends, guinea pigs, hiding house, hutch, princess piggy poo, sisters. 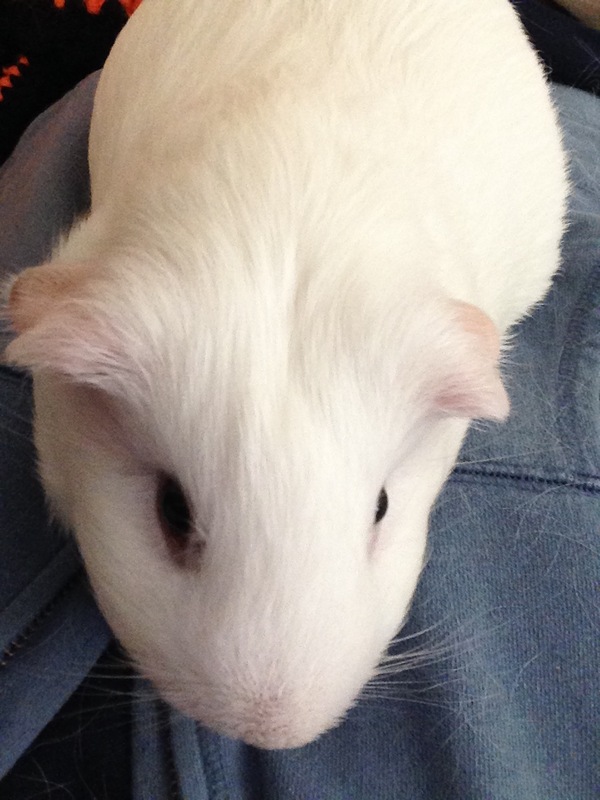 guinea pig. Bookmark the permalink.